The above signs were located at the entrance to the Rockport City Park. 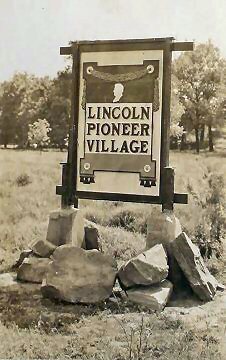 The Lincoln Pioneer Village is in the Rockport City Park. 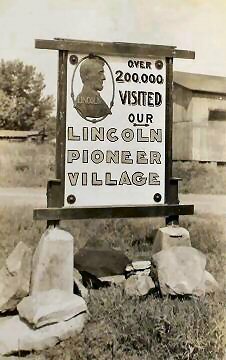 George Honig was the sculptor of the Lincoln bust on the sign. It is currently hanging in South Spencer High School. Visitors to the Village. These people may be attending a dedication. 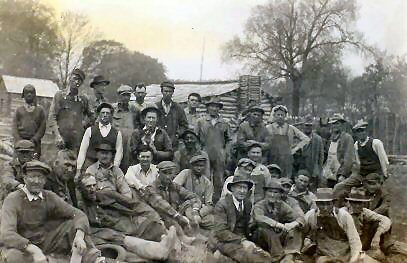 This photo appears to be of the men who built the Village. Logs are scattered across the grounds. Note the small boy on the left. 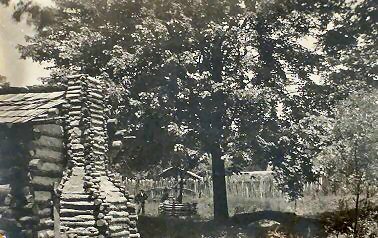 The Village well is shown in this picture. 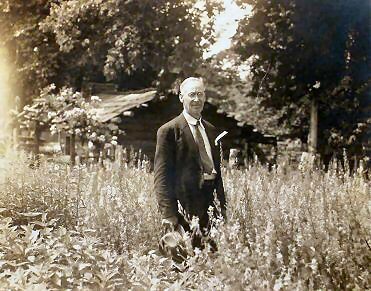 The Lincoln Pioneer Village designer, George H. Honig, walking through the Village flower garden. 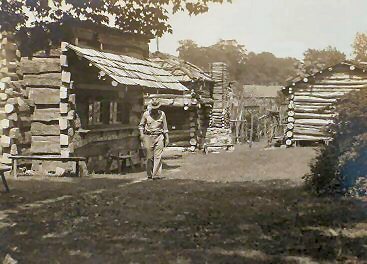 This photo shows the Grandview Blockhouse (center) which was torn down. 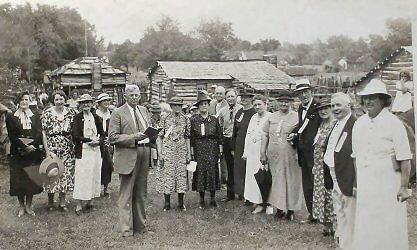 This photograph taken in the Village is of an unknown group. It may be the McGuffy Club. 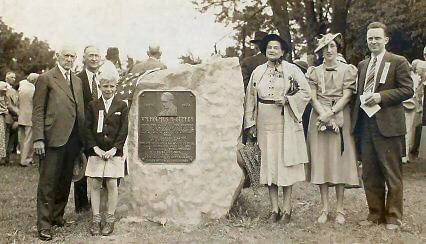 This is a post card of the dedication of the McGuffy Monument in the Village. 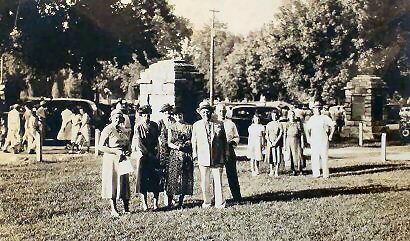 George Honig is on the left next to the monument and his wife is on the right next to the monument. 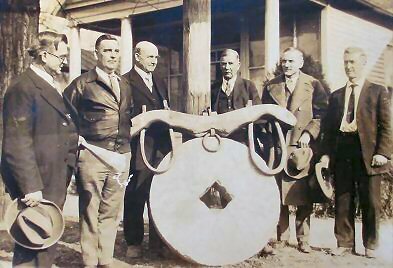 The millstone and ox yoke is thought to be part of the Village donations. 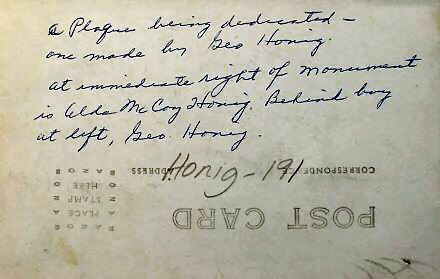 George Honig is at the right. 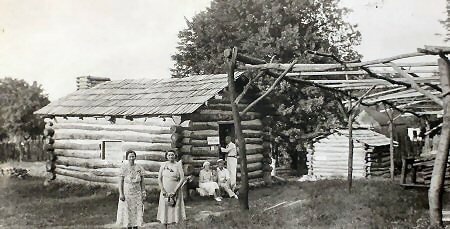 The photos on this page are courtesy of Willard Library, Evansville, Indiana--George Honig Collection.